Goi is a generic term for “salad” in Vietnamese. But typically it does not include lettuce like most traditional western salads. And just like the term “banh,” there are numerous different types of goi using different veggies, for example, goi ngo sen (lotus root), goi bap cai (cabbage), goi buoi (pomelo), goi du du (papaya), and goi bap chuoi (banana flower) to just name a few. Goi can also be name for the type of protein it contains, for example, goi ga (chicken), goi vit (duck), etc. What is almost a constant, however, is the dressing. Most are dressed with the familiar fish sauce based dressing, similar to the nuoc mam cham, but slightly more tart with additional lime. The salad goi is also different from goi cuon which is the term for spring/summer roll–not sure why, but perhaps there is lettuce and other veggies wrapped inside. What is different about this particular salad we present today is that the veggies are first “brined” so to speak in salt, wilting it, but still leaving a great crunch! In mixing bowl, combine thinly sliced celery, cucumbers, carrots, daikon, and jalapeno with 1.5 tbs salt and mix well. Cover and let it set in the fridge for about 1/2 hr. In the meantime, poach the shrimp. 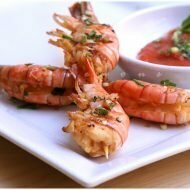 Andrea at Viet World Kitchen has a quick and tasty way to poach shrimp. In saucepan, combine 1/2 ts salt, 3 ts sugar, 2 tbs water and 1 tbs vinegar. Heat with shrimp until it turns opaque and orange, stirring to cook evenly. Drain and set aside to cool, then peel and set aside. You can split them lengthwise if you like to get the appearance of more shrimp in the salad Remove instant jellyfish, rinse with cold water, drain and set aside. By now the veggies will be more translucent in appearance and appear wilted. In colander, rinse off the salt well with cold water. Working in small batches, place the vegges in a muslin cloth and wring out the liquid—flex your muscles and try to get as much of the liquid out. Return the veggies to mixing bowl, add the jelly fish and shrimp. Serve topped with peanuts, fried shallots, chopped cilantro and dress with the more tart nuoc mam cham dressing. Banh phong tom, the round shrimp chips also make a great accompaniment. Note: “Instant” jelly fish is can be found at most Asian groceries. It’s much easier to work with then the salted ones. If you don’t have muslin cloth, you can just use your hands to wring out veggies. Crunchy, healthy, and so delicious! 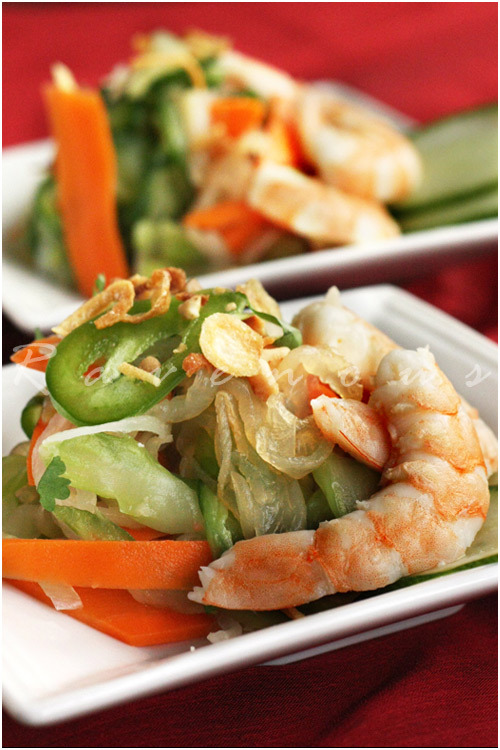 This easy goi recipe will be a great change up the next time you’re craving for an Asian salad. How lovely! You make such awesome food. Can I move next door? I feel like I'm learning so much from your posts. I'm even learning some Vietnamese. I'm going to go try to impress my friend Tammy now. Love all the flavors and textures, what a perfect combination and so refreshing! Will definitely have to try this. Ninette: Right now we don't have a house so it's hard to entertain even though we both want to–but when we do, you definitely welcome anytime you visit socal! Jessica: that's such a great complement! this Tammy friend of yours wouldn't happen to write for serious eats as well does she? Connie: The textures are a great part of this dish from the squishy jelly fish to the crunch of the veggies! As usual, your pictures are gorgeous! This goi is a favorite in my family, so I make it all the time, but I didn't know about "instant jelly fish." Thanks for that helpful hint! Ahh yes, goi a Vietnamese classic, for some reason with a Banh Phong Tom just adds an extra great fusion to this already lovely dish. Hey are you guys on twitter? I like the idea of brining the veg first! Wonderful flavours. This sounds so fresh and yummy…! 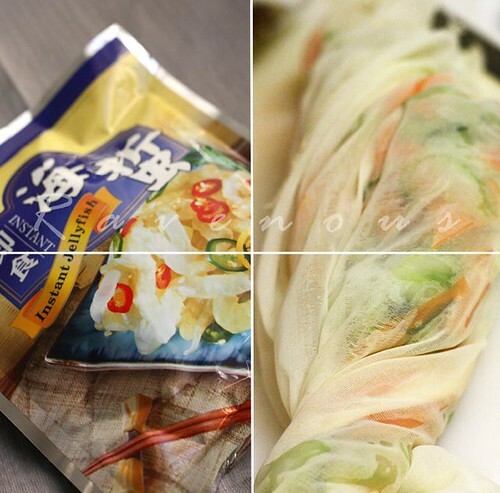 I am so glad I found your site, since I love Vietnamese cuisine, especially the varieties of soups and dumplings! 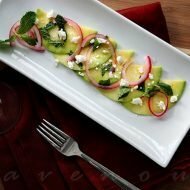 This is such a wonderfully refreshing dish. 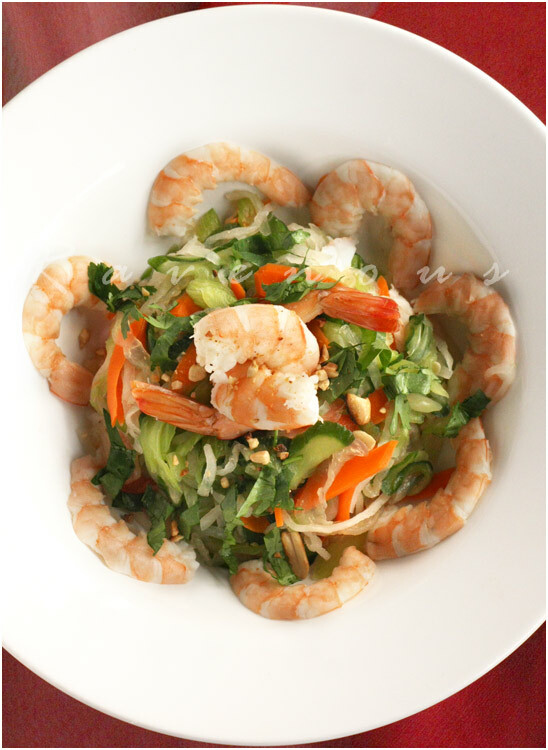 I like all the different textures and bright flavors from the vegetables and nuoc nam cham. lovely close up! Your prawns look so fresh and the salad looks bursting with flavours. pigspigscorner: The salt does add an interesting twist go this goi. cooking-gallery: Thank you! We hope you enjoy our recipes and visit/comment often! Fresh Local and Best: thank you! Em, where did you buy the instant jellyfish ? …Chị live around Little Saigon, but i never see that before in Viet markets ….Thanks in advance . Co Hai: Gosh, we bought it actually bought that here in LA at a small Vietnamese grocery and haven't really looked for it down in Little Saigon. It was pretty cheap too for about 1.50. Next time we go down there we'll look. Thanks em, i'll go and look around other Asian markets . This shrimp salad sounds really refreshing and so full of flavor. Co Hai: Let us know if you have success…i'm sure it's there. Divina: vietnamese goi is not your typical salad, but delicious. cookingpractice: 2 years is way too long! Definitely make goi and blog how it goes! I'm going to the Asian store tomorrow to buy those ingredients for Goi – is daikon something that is also available? And are the shrimps obligatory? The salad I tasted at a friend's house – the friend of the friend who did not want to share the recipe – hardly had any shrimp. Would it affect the taste? Hello! I’m Vietnamese as well and I *love* your recipes!! They’re so delicious :). 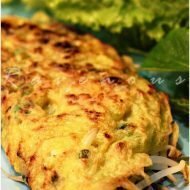 I’m trying to make this recipe, nuoc mam dressing, and goi ngo sen, but all the links seem to be broken (says access forbidden)- can you please fix?